This week I lost one of the most precious people in my life – My beloved Grandmother. I am at a loss for words to even remotely describe the heartbreak that I am feeling at this present moment. I am sure you will all understand that at this difficult time, I am finding it hard to comprehend returning to normal life – getting dressed up, going out and about, blogging etc. so I wanted to leave this tribute to my very special friend until she hopefully grants me the strength to return. My Grandma was the epitome of style and class – a true lady! She always dressed to perfection and from I was a very small child she encouraged in me, a love of fashion and style. 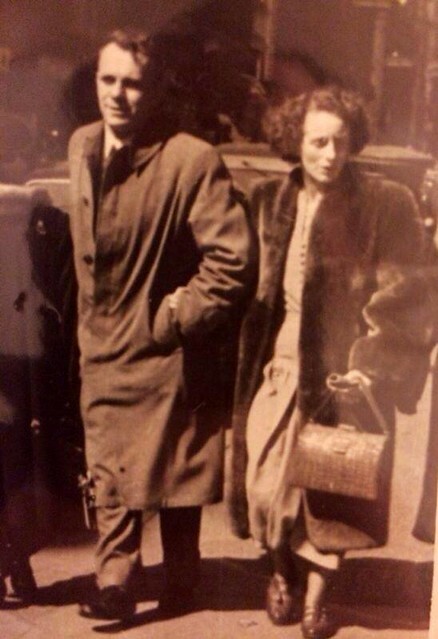 In the above photo you can see herself and my Grandfather, whom I know she is now reunited with in happiness – they were indeed a very stylish couple and to me, this picture looks like a paparazzi shot of two movie stars. I can see so much of myself in her as she, along with my beloved Mother, have made me the person I am today. I hope that throughout her life and beyond I have always and will always make her very proud. I cannot thank everyone of you enough for your help, support, comments, calls, visits etc. at this very sore time in my life. To find a positive in a very, very negative situation, it has shown me the true beauty in human nature and made me realise how blessed I am to have such a wonderful family and some truly incredible friends. Anyone that knew me, knew the very special bond that we shared – a bond that went much deeper than simply “Granddaughter and Grandmother” and it was such a pleasure and an honour to have shared my life, my friendship and my love with her. I am so grateful to have been with my Grandma when she passed away and get the chance to tell her how much she meant to me. I am more than proud to be able to call this amazing woman my role model, my best friend and my Angel. I'm very sorry for your loss. You have some great memories that you will cherish forever! One a loved one died, what gives us the strength to move on is the hope that we will see them again one day. Stay strong my, dear. And remember, it is okay to mourn until you can write again. I am so sorry about your loss. I'm so sorry for your loss Nicola. It's remarkable that you can turn to your blog and feel ok posting about this sort of thing. This shows how much of a good positive environment your blog is. I hope you have wonderful memories, take care. I can totally understand what you are going through, I lost my fad at very young age, so I know how it feels to loose someone that previous..
She so so elegant in the pic..
My prayer goes out to you and your family in this difficult time.